Fiber Optics sounds really high tech. 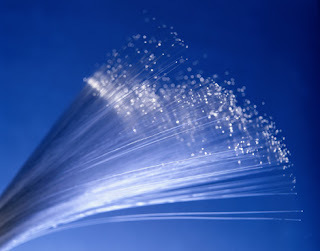 In fact, the term fiber optics simply refers to the transmission of data through the use of light. The use of fiber optics first became popular in 1970s. An employee from Corning Glass Works, Robert Maurer, developed a fiber through which data could be transmitted. Although the fiber used then was not as thin as they are in today’s world, the concept worked and the commercial use of fiber optics had begun. Today the use of fiber optics has increased. The cost of production has been dramatically reduced and increased installation as well as more advanced technology has all added to the overwhelming use of fiber optics. The telecommunications industry has incorporated fiber optics on a widespread basis. In the past, the telephone wires were made from copper, but beginning in 1980’s, most of the old copper wires were replaced with fiber optics cable. The phone companies began to use fiber optics to carry large volumes of voice traffic between large offices, but over time it became much more common. Fiber optics allows phone companies to send “theoretically” unlimited amounts of data. The bandwidth, which is the measurement of the amount of data that can be transported by a particular type of media, is very large, thus allowing the transport of large amounts of data. The larger bandwidth has been an important advancement as voice, video, and data information needs have skyrocketed, especially with the advancement of the internet. Copper wire tended to have more loss, especially if the data needed to travel large distances. Fiber optic cable has low loss and is far more reliable than copper wire. Any system using fiber optics has three components. There is the transmitter, the fiber cable or the medium, and the receiver. The transmitter takes the message and converts the electrical signal into light and sends it through the fiber. The receiver gets the signal and then converts it back into an electrical signal. The fiber optic is made up of different elements. The core is the light carrying element and is at the center of the fiber optic and is surrounded by the cladding. The cladding is made up of silica and it has less refraction than the core. The reduced refraction index makes the light in the fiber reflect off the cladding and stay inside of the core. One of the properties of light is that it can bend under the right circumstances, and fiber optic cable provides that circumstance. The refraction index refers to the ratio of the velocity of the light in a vacuum to the velocity of the light in a material. Light in a vacuum has a speed of 300,000,000 meters per second. The higher the refraction index, the slower the light will travel through the material. The core and the cladding have several layers surrounding them referred to as the buffer coatings. The buffer coating works for protection as well as provides a type of shock absorber. Surrounding the buffer coating is a strength member. The strength member’s main function is to protect against pulling damage, which is especially important when installing the fiber. The strength member is then surrounded by the outer jacket, which protects the fiber from any outside environmental factors. Fiber has two types. The first is single mode and the second is multimode. When looking at fiber sizes, they are reflected by using two numbers. The first number gives the core size in microns and the second number is the size of the core plus the cladding size put together. The single mode fiber has a really small core making the light travel through a straight path. The typical size of a core in a signal mode fiber is about 8 or 10 microns. It has unlimited bandwidth and can transport data about 80 kilometers without repeating. Multimode fiber allows light to be transported in multiple paths. Multimode fibers have a larger core size of about 50 to 62.5 microns. Multimode fibers can be manufactured in several ways. One way is the step-index, which has a change or step between the index of refraction of the core and cladding. Graded index fibers reduce the modal dispersion found in the step index. Modal dispersion happens as light travels through the core at higher or lower modes. The graded index fiber is produced with multiple layers with the highest index of refraction at the core and the lowered index of refraction on the outside. Higher order modes keep reflecting the light back towards the core and therefore the multimode graded index fibers have much less of the light pulse and have a higher bandwidth than the multimode step index fibers. Modal dispersion does not affect the single mode step index fibers because the light travels in one single path. Fibers are put together into stranded or ribbon cables. Stranded cables are when individual fibers are put together in a bundle. Ribbon cable is made up by putting up to 12 fibers together and then coating them with a type of plastic to form a multi-fiber ribbon. Either way, the transport of data, voice and video can be done much easier with fiber optics and makes serving the needs of today’s data driven society much more efficient than it was with the old copper wire. you're reading my article in my blog Fiber Optics and you can find something Fiber Optics ini dengan url http://technologyfactory.blogspot.com/2011/12/fiber-optics.html, you can publish and copy paste for you Fiber Optics it's very use full Fiber Optics sumbernya.